Woowee!! We’ve got a lot to cover today!!! 2 migrations to new hosting – one of those was from HostGator and had all kinds of goofy stuff deep in the host files that had to be fixed. Way worse than what we see coming from even Bluehost, which is generally the most nefarious for making sure your site doesn’t work at a new host. We’ll be doing full site audits on these this week. 3 site audit fixes projects completed – including one who reported immediately getting more traffic. This past week I also completed pulling down all 3 of my test sites at different hosts and setting them up fresh with WordPress 5.0.3 and the TwentyNineteen theme. I filled them with some dummy content and ran a baseline speed test. Yep, you heard that right!! GPSI is now back on my okay tester list since they changed over to Lighthouse reports. Prior to this I advised not to chase that dragon. That’s what we’ve called it in the performance industry, as a good score on GPSI has been a myth and not worth going after. In fact, in the speed tests I ran this time last year, using their old interface and reporting, I was able to get a test site to a 100 score. It was nothing I could make money with, though!!! And, the faster I made the site, the more the score started dropping. That’s probably not going to be true anymore with the way Lighthouse audits, especially the real-world data as reported by the Chrome browser real folks are using. The very first speed test was super revealing!! I tested the same post on all 3 servers and the clear winner was Litespeed. It’s the fastest thing right out of the box. Not only did it score 100 on GPSI, it passed all 18 of its audits! Go see the test results for yourself on my BlogAid Today livestream. And be sure to Like, Follow, and turn on Notifications so you always know when I go live. Thank you to everyone who Likes and comments on my posts there too. It helps ensure you see it in your feed, and lets FB know to show it to more site owners. And that helps support the free and helpful info you get from BlogAid too. It only takes a moment to show some love. This weekend I spent time loading up those test sites with a Genesis theme, plugins, images, and filling up the sidebar, and with all the other sorts of things that we use on real sites. I ran a new set of tests and of course the scores dropped. Then I added Cloudflare and did another set of tests. And then I added both WP Fastest Cache and then traded that for WP Rocket. I’ll have reports for you on the fastest combos and what caused the most issues soon. Of course, all of this was a prelude to doing the new social share buttons case study. I’ve started it with Scriptless Social Sharing and will be digging deep into how y’all use it for social media, like adding special things for Pinterest. And before I leave that plugin, I want to test it in combination with other Pinterest plugins, like Tasty Pins and such. So, I’m at the point where I’ll be polling my Site Audit Plus clients in our private Facebook group about their combos and techniques. I’ll also be calling on my secret influencer for more guidance too. I’ll tell you who that is once we get close to releasing the results. In last week’s Tips Tuesday I mentioned that I was going to start research into what Mediavine recommends for speed and such, as 60% of my site audit clients use them for their ad agency. Well, Amber from Mediavine saw that and commented on the post and invited me for a chat. Oh you bet I jumped right on that and we had a very good talk on Thursday, just ahead of their livestream announcing all of the new things they have coming for 2019. I’ll be coordinating with Amber and lead dev, Eric, on my new speed tests, as well as sharing audits from some of my clients and what they are facing with regard to speed issues on their sites. All of it is in an attempt for us to both get on the same page with what we are recommending our clients do to speed up their sites and make more money. I’m excited about testing their Create plugin later this year, and the new theme framework they will have coming toward the end of the year too. I was very disappointed to discover that a wall joint tape job was so poorly installed by the previous owners of my house. It is on the only sheet rocked wall in the garage. That tape bubbled right up when I put the first coat of Kilz on the wall. I tried to do a light mud patch, but it wasn’t enough. So, I ripped all that tape and mud right off the wall and did it right. That spot on the wall will be dead center of all videos I’ll be making and there was no way I could leave it like that. It’s a shop wall, so it doesn’t have to be perfect, but it can’t be like that!!! There were 3 warm-enough days this past week for me to do a new mud and tape job, put 3 light coats of Kilz on it, and then a coat of real paint. All of this put me another week behind my original plans. I feel like I’m taking one step forward and two steps back with the new woodshop project. But, I know I will appreciate having put this time and money in up front to make things right. I also got the last 2 LED bar lights hung. That makes 4 in all. It’s lit up like day time everywhere and that will help me make great videos and still shots of everything. That’s really going to pay off on social media sites like Pinterest and Instagram and such too. I’ll be so happy when it’s warm enough again to get in there and play with the new camera to get my shots perfected. And then on to making those video tool reviews and my first woodworking projects!!! It’s a 900 sq ft garage, so there’s no heating it adequately when it’s 18 degrees at night. But since it’s in the basement, a 40 degree day is plenty warm enough to be in there playing. So, I’m not shut down for the whole winter or anything, and I can hardly wait to get going in earnest. Would You Dump Your Sidebars? While I was looking at the 6 themes the folks at StudioPress recently optimized for Gutenberg, I realized that none of them have sidebars turned on by default. Okay, so that makes sense considering mobile-first design nowadays. 80% of BlogAid’s traffic is still desktop, so sidebars still make sense for me on that site. But I think most of my woodshop visitors will be on mobile. I polled my Site Audit Plus clients and they confirm that they still like the look of sidebars, but they don’t put any money-makers in there exclusively. They are careful to include those things either in, or as close to the content as possible. With all responsive themes, the sidebar goes into a single column below the post and its comments. So, most folks never scroll down that far to see any of it. Most of us use full width on pages, especially sales or landing pages. It’s just on posts and archive pages that we include sidebars. Will your next theme have sidebars on blog posts or not? Let us know in the comments of the post, or anywhere you see this post online? There was a firestorm released against Home Depot on Instagram this weekend. Seems they are stealing the images of DIY creatives and digitally retouching them, or such, and using them as their own without giving proper credit or payment to the originator. Folks are blasting them over on Instagram for it. And that brings up a sticky issue. Most of y’all do a great job of branding your main image to be posted on Pinterest. But, I don’t always see watermarks on your other images in the post. And I almost never see them on images posted to Instagram because they encourage you to take shots on the fly with your phone. Non-watermarked images are ripe for folks to rip off on Pinterest and point the URL to themselves. They even have bots that will scan your site and download all of your images and use them as they please. I know there is software that will try to cover up watermarks too. So, I’m thinking it’s probably a good idea for you to find ways to watermark every image and make it tough for folks to remove it. Do you have any tips and tricks for doing this, especially shots from your phone? Please do share in the comments below, and feel free to share in our livestream recap later tonight too. Speaking of pretty images, yesterday there was a major meltdown about a questionable communication from Pinterest via a single blogger. I’m not going to get into that drama. I just want to say 2 things about it. This same thing happened with GDPR and it was all I could do to put out the fire and keep folks from going over the cliff with the herd until I could investigate and get them the info they needed to make a good decision for their site. Don’t freak and don’t make changes. Let the dust settle on this and let more reasonable voices come forward about it. The old adage about the risk of putting all of your eggs in one basket has been around for eons because it’s true. Seriously consider the awesome power of SEO that will bring you traffic day in and day out for years no matter what happens with social media platforms coming or going or burning to the ground. It’s always a good time to get into the DIY SEO course and get that solid foundation laid for your site. Google has been tweaking on their Image Search for all of 2018, and they aren’t done yet. In his weekly Search Engine Land roundup, Barry Schwartz mentioned that Google said even bigger changes are on the way. We don’t know exactly what those changes are yet, but I will be keeping my eye on this for us. You may remember a few Tips Tuesday’s ago me mentioning that I’ve been testing new robots.txt directives based on what we’re seeing in the new Google Search Console interface. I released my new recommendations to the DIY SEO course members in our recent Technical SEO workshop, and to my Webmaster Training course folks last week too. And here’s the reason that I kept the directive in there to shun bots off our PDFs, as most of them are attached to our freebies. Google is not only crawling them, it’s pulling from them to show answers in featured snippets. So, if you don’t want your optin freebie to get shown in search for anyone to get without signing up to your newsletter, keep the bots off it. Better yet, don’t even have it on your site. Upload it to your list serve’s library. MailChimp and others allow you to do that, so the link to the freebie is behind their firewall and only available to folks in the confirmation or thank you email. I think some of the cheaper list serves don’t have that feature, so you may have to research how to serve these things from another place, like Amazon S3 or Google Drive or such. Here we go! I believe this is going to become a common news story. A week or so ago I reported that Beyonce was hit with a lawsuit for lack of ADA compliance on her site. Now Dominos has been hit with one too. ADA is Americans with Disabilities Act and site content and images have to be tagged properly for screen readers. I’ve done my best to stay away from WPdrama anymore, but last I heard, the team lead in charge of making Gutenberg ADA compliant resigned due to lack of support from the higher ups. And now they are holding the equivalent of a bake sale to raise funding for getting Gutenberg independently tested for ADA compliance. So, this may delay my recommendation for everyone to switch to Gute. However, it may not delay my switching to it on the woodworking site as it has such small traffic right now and I need to keep on top of using Gute. So, if you want to go to Gute now, or start a new site on it, just know this issue is looming and we don’t have any dates for when it will be fixed. For everyone still using some type of classic editor, your content is properly marked up for screen readers. You just need to ensure you are placing the proper Alt Text on your images so they can be read too. Google also picks up that Alt text for its Image Search as well. So it’s important for SEO too. I’m thrilled to see this!!! WordPress finally has a new Gutenberg Block repository. It’s just like the repo for themes and plugins. Now, not all the gazillion new blocks out there have been listed yet. Just like with themes and plugins, the developers have to submit their listing and it has to go through a review process. It’s causes a delay, but in the end, this is a good thing and will be a great place for us to find new blocks. It will also encourage more block development. There are several new block sets, where one plugin has a whole suite of blocks. There is a new one I want to check out for pre-made design blocks. They have lots of templates. And I can see this ushering in a whole new set of Gutenberg themes that give you a base structure, but let you choose block sets for on-page design elements. You may remember me reporting a few weeks ago that Genesis 2.8’s new base theme is using Atomic Blocks for the home page. So, this is definitely the trend and I’m looking forward to playing with it more next month before I decide on a new child theme for the woodworking site. Now, widget-ready home page type themes are not going anywhere. And this block stuff is still bleeding edge. So, don’t think about throwing out your current theme over this on your existing money-making site. But, for any brand new site, it is worth considering, if you can afford the risk of new tech that may not always be fully stable. You may recall last week that I reported on the timeline for the release of the next major WordPress update, which is version 5.1. Betas are already out and the public release is slated for end of February. But, that may be delayed if this report on ZDNet is accurate. A couple of prominent hacker peeps are saying there are security holes in the new white-screen-of-death protection feature that is the new, shiny thing in WP 5.1. They say while it is supposed to help you recover your site if a plugin update goes wrong, it could actually be exploited by a hacker while in that safe mode state to access other parts of your site and do who knows what. So, I’ll be keeping my eye on this for us. And as always, I’ll report when I think it is safe for us to upgrade WordPress with any new release. Want sites to load faster for you, especially on your phone? Then be sure to use the Chrome browser. 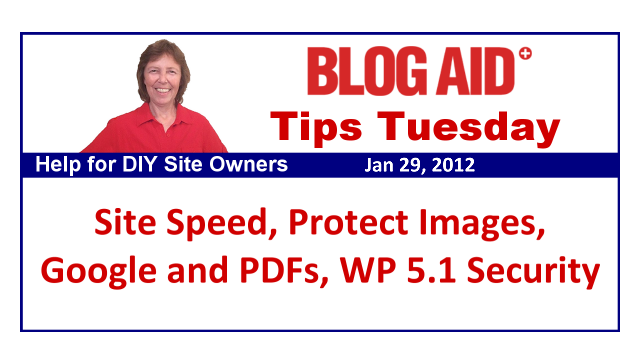 And encourage all of your site visitors to do the same so your pages and posts load faster for them too. I want to thank fellow webmaster John Sawyer of The Small Business Website Guy for sharing this rather technical post about how the HTTP/2 protocol prioritizes site requests. Chrome does it better than any browser, which means more site items come across in parallel, so they load at the same time. It’s the browser I set WebPage Test to when I run speed tests too, and of course, it’s the one used for Google Page Speed Insights. You’ll also see in the report that Safari just doesn’t cut it. So, if you have iOS devices or even a Mac, might want to think about using Chrome as your default browser. Can You Use Super Bowl in a Post Title or Not? I’ve seen folks in affiliate marketing and blogger groups say that you can’t use trademarked phrases like “Super Bowl”, “March Madness”, or “Sweet 16” in your post title or content. Yet I see plenty of foodie blogs that do just that when sharing recipes for the big games. If you Google Super Bowl snacks, you’ll see plenty of them in SERPs. I polled some of the SEO groups I’m in and they say you can’t use those terms if the site is for-profit, meaning that you’re selling something directly attached to that trademark name. So, foodie bloggers who have ads on the site are not selling any Super Bowl stuff, they are just informing folks for free about good food to make for their house party. To me, this is a little bit of a fine line, because the site itself is for profit, even though it is indirect selling. It’s right up there with the gray area of a store playing a radio behind the counter that’s loud enough for every visitor to hear, but is not technically being pumped through the PA system. They can say it’s just there for the enjoyment of the employees and they are not profiting from playing the music to put the shoppers in a good mood. The foodie blogger group folks say site owners get slapped with penalties, but provide no concrete examples nor documentation of that. Is it a Google penalty waiting to happen if you do it? Or are you missing out on a great seasonal search term if you don’t do it? Do you just substitute the phrase “Big Game” or such instead, and miss some of the direct search traffic? Let us know in the comments or anywhere you see this post online. Who knew about the super bowl stuff!! Thanks for all the helpful tips. Looks like the Gutenberg folks would have looked at ADA compliancy. WP does have a compliance team, they just got no support. And ramrodding this thing through was a mistake. I know for a fact you cannot use Bourbon Derby Pie anywhere in a post or description. It is copyrighted and monitored. I received a takedown warning on it and was given 10 days to remove it or I would be sued. Scared the crap out of me and I am never using brands or names again. I was not monitizing my blog so no harm no foul and lesson learned. I also am seeing that audio in YT is being monitored. When I first started doing video I went into you tube for approved songs to use and did a few videos with them. I am now getting notices that I am not in troulbe and do not need to take down the audio. They are notifying me that ads are being added to my video . Apparently, using those free songs does not keep the owners from adding their ads even when they are marked available for use. If I can find a way to remove audio I am doing it on all my videos regardless of who owns the songs. Any suggestions for that? Most everything I tried is buggy and wont work. Appreciate the example of a take down notice for a trademarked phrase. Yeah, have to be careful with free anything – audio, images, and such. There are catches to a lot of things. But, them being approved by YT and then them doing ads on them later is a nasty surprise. I’ll most definitely keep that in mind!! I don’t know how to edit out the audio on a video already published.